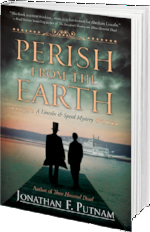 I am so grateful for the reception I’ve received on my historical mystery Perish from the Earth since its publication in July. I’ve had a fantastic time touring around the country and seeing many of you at bookstores, libraries, and industry conferences. I’ve included a few pictures from my book events below. I’ve also been thrilled with the critical reception for Perish from such publications as Historical Novels Reviews , My Shelf, and Criminal Element.